The lady of the house is faced with the demands of a rebellious maid. An unlucky house holds no fears for a husband with a domineering wife. Things are not as straightforward they seem at this upmarket restaurant. The arrival of a first grandchild provokes some rivalries between families. 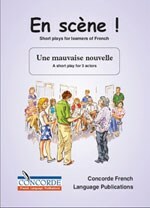 En scene, a collection of 8 short plays.